Convenient location in center of town. 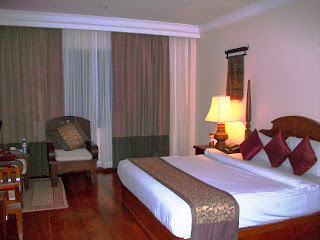 I had a spacious room and it was quiet although the hotel is on the bustling Sivatha Boulevard. I also appreciated the fact that my room was very clean. The hotel is a minute's walk to the supermarket at Lucky Mall where I could buy beverage and snacks for my sightseeing trips (It's important to take water and/or beverage of your preference wherever you go because it's so hot, you'll need to hydrate). The buffet breakfast was generous. There was something different for me to eat everyday and the staff were attentive to my needs. The hotel also employs tuk tuk drivers so I could easily and safely go around town. Lunch: 11:00 a.m. to 14:00 p.m.